Stop Everything And Look At These 15 Chubby Kittens Right Meow! 1. She wears horizontal stripes to accentuate her curves. 3. "I didn't choose the chub life. The chub life chose me." Fat little kitten belly is made for scritches. "This is where the kitten food goes!" 5. "There's just more of me to love!" 7. I like kitten butts, and I cannot lie. 9. My goodness, that is a very chubby kitten. 10. "I'm fluffy, and I know it." 11. Too fat to move. Too cat to care. 13. "We're not fat. We're fluffy." 14. "I'm not overweight, I'm undertall." 15. "I'm in shape. Round is a shape." Can You Scroll Through These Chubby Bulldog Puppies Without Screaming 'OMDOG!'? 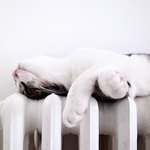 Why Do Cats Like Sleeping on Warm Things?